With its cast of characters including St George and a dragon (obviously! ), King Bladud and Mrs Bladud, Bold Slasher the Turkish Knight and a doctor who raises patients from the dead, plus an excellent band, this was an amiable celebration of Englishness without xenophobia or pomposity: often funny, always musically pleasing, and occasionally quite moving. And, an innovation for opera, it even had choruses you could join in on. The first performance of the opera was on the 4th June 2012 as part of Chippenham Folk Festival and the second on 8th June as part of the Bath Fringe Festival. 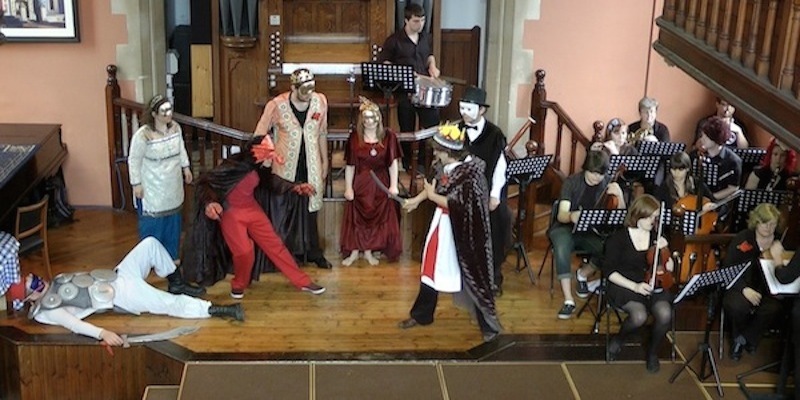 At the time of these performances the Fiery Dragon Folk Opera Company was based in the Music Department of Bath Spa University with many students participating in both the band and the cast, though with a significant number of non-student musicians and singers also contributing. The most recent performance was on 12th January 2014 at the Wiltshire Music Centre as part of the Bradford Roots Festival with a reconstituted cast and orchestra no longer based in Bath Spa University, although many of the singers and musicians had sung in the original performances. The large audience at this superb venue gave us a rousing and very satisfying reception. Although the Fiery Dragon Folk Opera Company is no more, its successor, the Fiery Dragon Company is very much in business as the rest of this site testifies. It is very likely that at some future date there will be further stagings of the opera with the Fiery Dragon Company at its heart, and also a concert suite derived from the opera. Make Room for Mummers is based on the play performed by the Widcombe Mummers from Bath. Narrated in song by the legendary King Bladud, who founded the city of Bath, and his fair Queen Mrs Bladud it tells the story of a brave knight called George and the beautiful Egyptian Princess who is hunted by a dreadful fiery Dragon, another brave but unfortunate knight called Bold Slasher, and a doctor who is so skilled that he can bring the dead back to life again. Here are four clips from the opera. The first, from the beginning of the opera and filmed from within the audience, is from the performance at the Wiltshire Music Centre. The second clip shows the dragon’s first appearance as he threatens the princess. Filmed at the Wiltshire Music Centre. his miraculous cures. It is from the first performance at The Cause, Chippenham. The fourth, at the end of the opera, was also taken at The Cause. 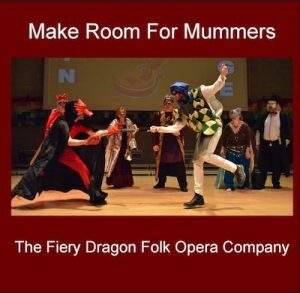 Finally, for the curious, here is a video of a performance of the original mummers play on which the libretto is based. The performers are the Widcombe Mummers of Bath and the play is their St George’s Day play from 2011. We have produced a full cast CD recording of the opera. This recording features the cast, band and conductor of the January 2014 performance. Click here for details of the CD and how to obtain a copy. You can also listen to and download one of the movements.